If you think that all pool deck materials are created equal, think again. The kind of material that is used to create a deck has a profound effect on style and comfort. This is especially true in hot parts of the world, where the sun’s rays beat down mercilessly to make the ground uncomfortably hot. When you consider the remarkably cool design of coral stone pool pavers, then, it comes as no surprise that they have become so popular in warm parts of the U.S. In states like Florida, Nevada, California and Arizona, people are discovering the benefits of using coral stone for their swimming pool outdoor decks. The last thing that you want your swimming pool deck pavers to do is to absorb heat. Nothing can ruin the cooling effects of a quick dip in the pool quite like flaming hot concrete. Coral stone reflects the rays of the sun; in turn, it absorbs very little heat. The end result is a swimming pool flooring deck that is wonderfully cool to the touch, even in punishingly warm climates. Sales of coral stone pavers have gone through the roof in states where the weather is exceptionally warm, and the trend is sure to continue. 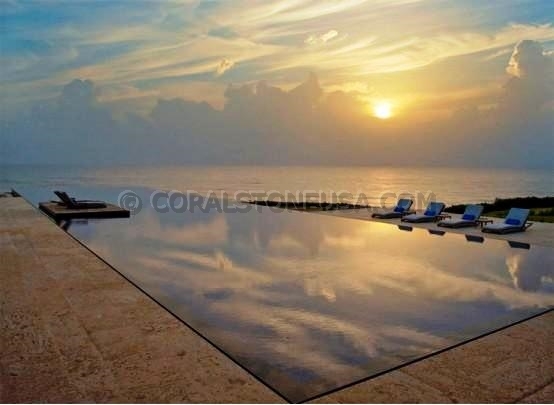 In addition to being cool to the touch, coral stone pool pavers are exceptionally attractive. These pavers do not require a lot of tweaking to look absolutely stunning. People appreciate the natural beauty of these pavers, which serves to increase their popularity even more. When you opt for coral stone, you don’t just keep your feet cool – you get a swimming pool area that is truly pleasing to the eye. Gold, white, red and other attractive hues converge to create effortless elegance and unparalleled style. When compared with utilitarian options like concrete, it is easy to see why so many people are setting their sights on coral stone. The difference in terms of comfort, quality and style is simply unbeatable. As if the cool-to-the-touch feel and attractive appearance of coral stone pool pavers wasn’t enough, they are also remarkably safe. That’s because they don’t become overly slippery when wet. Slips and falls need to be avoided at all costs, but some pavers become extremely slick when they are wet. That is not the case with coral stone, so you can have it installed without having to worry about excessive slipperiness or other issues. As sales and installations continue to climb in the warmest parts of the U.S., it is safe to assume that coral stone will become more widespread elsewhere as well. The natural benefits of these first-rate swimming pool deck pavers make them practical and stylish options no matter where you live.